Item number 1590/139 from the MOA: University of British Columbia. Owl-shaped brooch with three ear-shaped extensions on top and engraved details. Cross-pin at heart-shaped cutout. Hallmark in square cartouche at base of brooch. Silver ornaments represent an important part of early exchange between Europeans, including fur traders, and First Nations people, especially in eastern and central Canada and the U.S.A. Initially, the main source of silver was British, French and Spanish coins. Most ornaments were produced by silversmiths of European origin in North America and Europe, and were actively traded only from 1760 to 1821. By the mid-18th century silver objects were produced in New England, Quebec and Montreal. 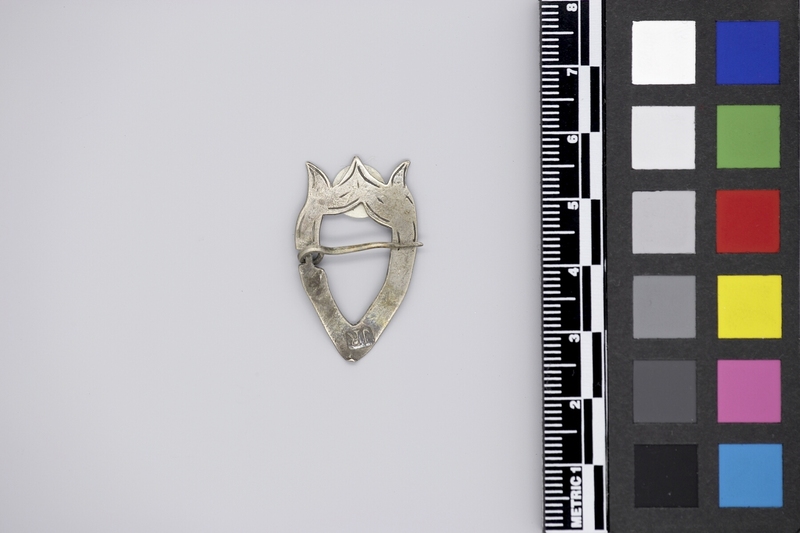 Silver was used by First Nations people as a sign of rank. Silver ornaments in these styles continue to be produced by native silversmiths in central Canada and the USA. Brooches were the most popular and numerous silver ornaments. They were worn on the chest, but also in the hair. Frequently, many were worn at once in rows across the chest. Repousse is a type of ornamentation formed in relief in metal by hammering up from the reverse or inner side.